Getting your new website indexed by Google (and other search engines) is one of the most important things for a new website. Your website will not appear in the search results if it does not get indexed by the search engines. Remember, Web Page Indexing is very important if you want to get organic traffic to your website. Next, you don’t need to get worried to index your site in the search engines. Google will take care of it on its own. The search engines will crawl and index your new website automatically. You don’t need to do anything new to get your website indexed. But, this activity will take some time. Search engines will take their own time to index your website. So, the next question that will get raised to you will be – how long does it take Google to index a new page or website in its database? Well, there is no fixed answer to this question. Generally, it takes 4 weeks or 1 month to indexed your new website. But, this answer has been also challenged by those who claim to have indexed sites in less than 4 weeks. The similar logic will also apply to all new web pages added to your site regularly. The only difference will be – Now, Google will not take 4 weeks or 1 month to crawl your new blog post. It will take less time than before. This is because, once, search engines crawl your new website, it will adjust the crawl rate automatically. Google uses a sophisticated algorithm to determine how often to crawl your site. Based on your site structure, it will adjust the crawl rate automatically. Next, in Google Webmaster, there is an option to adjust the crawl rate. But, adjusting the crawl rate does not mean, Google will index your website faster. Instead, this feature will ensure your site do not face heavy server loads due to Google crawl. Overall, Google will take at a maximum one month to find your new site and add it to the database. Meanwhile, you can access your site directly but it will not appear in the search results. But, don’t you think? It will be foolishness to wait for Google to indexed your new website. Instead, Why can’t we force Google to index your new website within 24 hours. Yes, you heard it correctly. It is possible to get your new website or blog indexed faster and thereby indexing all the new blog posts instantly without taking any time. Get A New Blog Posts Indexed Instantly. Please refer to the below article completely. And, don’t worry, all the tips given below are available for free of cost. We know this problem is generally faced by the beginners and for them, it is not possible to invest money at this stage. Hence, assuming you’re a beginner and started a new site recently, we have written below the article. Trust me, after reading below tips, your site will get 100% crawled and Indexed by Google. Create an account on Google Webmaster (also known as Google Search Console). This is the first step to get your new website indexed quickly and easily. Google Webmaster, will share the progress report of your website in Google. It will help you to find which all pages are not indexed in Google and Why? Hence, you can resolve the problems and thereby get your entire site indexed in Google. So, creating an account on Google Webmaster is the first step for indexing your site. Yes, it is free to create a webmaster account on Google and even all other search engines available online. Pro Tips: Do not forget to add all the versions of your site. For example, WWW and Non-WWW and similarly HTTP and HTTPS. Add all these four versions to your webmaster account. Sitemap map is simply a list of web pages available on your website. To get your site indexed quickly, it is always advisable to create a sitemap and submit to Google using webmaster account. This will help Google to easily find web pages on your site and add it to its database. In simple words, it is just like a creating index page of the entire book (website) and then informs Google about it. Pro Tips: It is also advisable to create HTML sitemap for your users and search engines. HTML sitemap also has many additional benefits over normal sitemap. At last, submit an XML sitemap to all search engines using their respective webmaster account. Next, share your site on various Social Media Networking sites like Facebook, Twitter, Google Plus, Instagram etc. 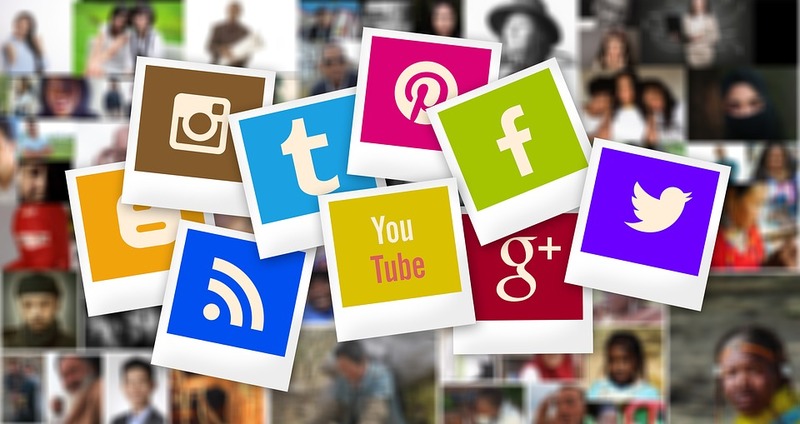 Social Media sites will not only help you in promoting your content but also provides free backlinks and force Google to index your content. 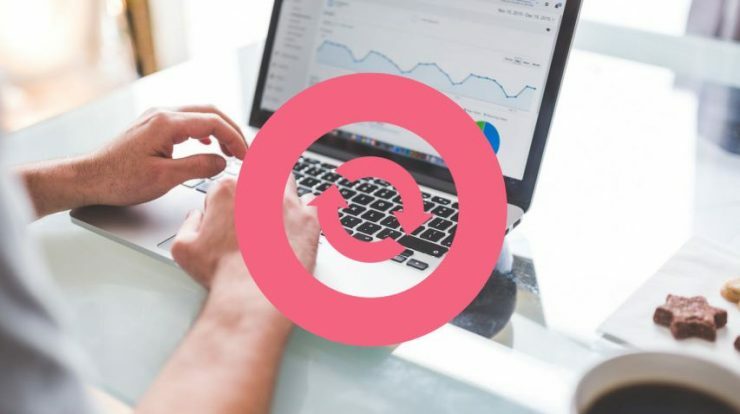 In simple words, when people start visiting your site using social media, Google will take a note of this and will start indexing your site fastly. Pro Tips: Practically, it is not possible to manage so many social accounts online. Hence, we strongly suggest using this free tool to automate your social media activities online. Try to build high-quality backlinks for your homepage and internal webpage also. Like Social Media sharing, this will force Google to index your site immediately. We know, for a beginner it is very difficult to build backlinks for a new website. Hence, below, we have written many good articles to create good quality backlinks for free. By creating backlinks, you are asking Google to index your site through someone else. It means, when google crawl the third party site (containing your website link), it will get your site reference and will redirect to your site to get it indexed. Hence, if more number of people link back to your site then your new website will get indexed fastly. 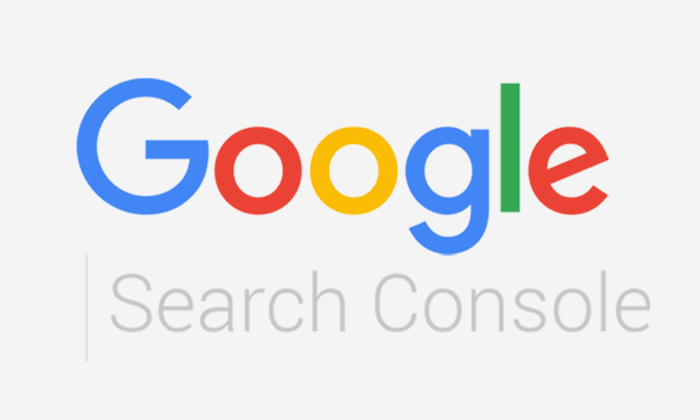 In Google Search Console, there is an option to fetch your site like Google. All you need to do is put your site link in the given box and click on ‘Fetch’ button. Next, you can ask Google to index the given link and all other links mentioned on that web page. In simple words, it allows you to submit the web page manually to Google. Next, it also helps you to stimulate, how Google will see your submitted web page. Hence, you can check, how your submitted web page will look like in Google search results? Note: In 2019, Google, replaced the above tool with new improved URL Inspection Tool. Don’t worry, the new tool is also available for free and easy to use. Before 2019, there was an option to manually add any links to the Google database. But in December 2018, Google removed this option. Now, you will need to use URL inspection tool to request Google to index your submitted web page. All you need to do is input your blog URL and wait for Google to retrieve the data. Next, Google will share the updated status and will allow you to request indexing if it is not indexed yet. 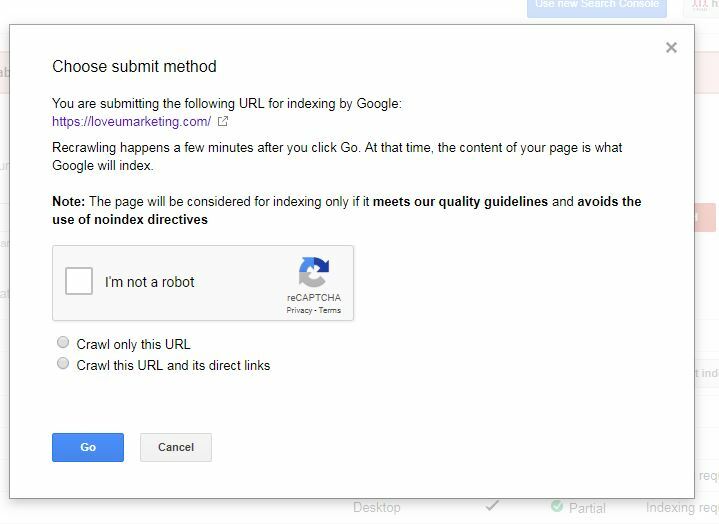 In simple words, this tool will help you to manually request Google to index your submitted URL. Note: This tool will work only for your owned and verified the site. Hence, you can’t use this tool for someone else site or to get your backlinks indexed fastly. Next, this is the best tool to get your blog posts indexed instantly within minutes. Yes, you heard it correctly. Using this tool, you can index your blog posts in Google within a few seconds. For proof, please check the below snapshot. The last but the most important tips to get your content indexed immediately is Ping URL. Ping your blog post URL to google using online websites or tools. There are many paid and free website providing ping services. All you need to do is input your URL and click on the ‘Ping’ button. That’s it. It will now ping your submitted URL to all major search engines and web directory. 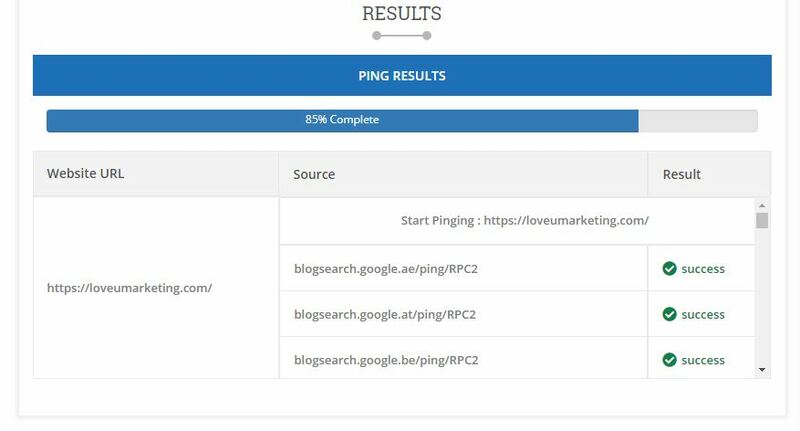 In simple words, this tool will ping all search engines and web directory informing you have added new content on your site. We strongly suggest using the above-mentioned tips for all individual web pages available on your site. Remember, by submitting and ping your main URL or homepage will not help you. Repeat all the above-mentioned tips for all the blog posts including the homepage. That’s all. If you follow the above-mentioned tips then your site and new blog post will definitely get indexed immediately within no time. Further, none of the above-mentioned tips has any negative impact on your site performance. 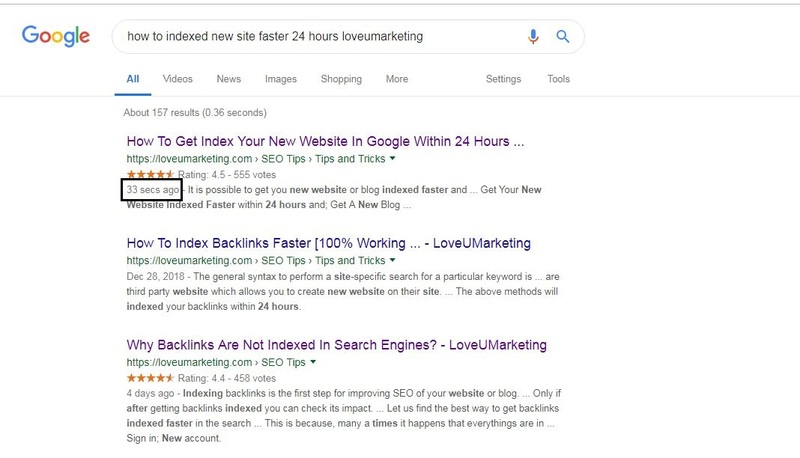 Instead, it will boost your site ranking if you have a good number of backlinks, social media sharing and 100% indexed web pages in the search engines. All the above tips are applicable for all kind of search engines. If you want to use them for other search engines then you can use the same without any worry. Everything will remain the same except the terminology and tool names used in the webmaster account. Every search engines will have their own unique webmaster account. So, you need to find the equivalent tool in all webmaster account. At last, if you face any problem in indexing your blog or its blog posts then feel free to contact us. We will be happy to help you.